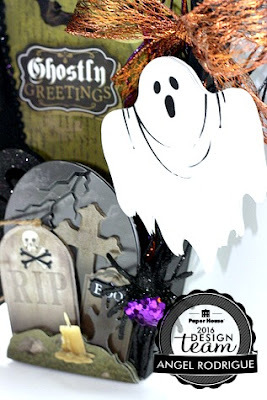 Who’s ready for more Halloween Decor!?! 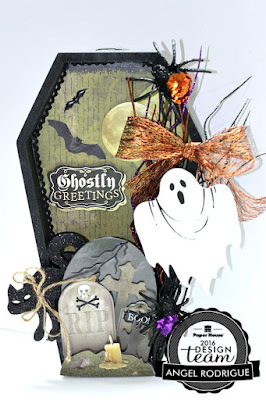 Today I come to you with this Coffin Shadow Box using those awesome Halloween Shimmers! What I have done here is use the Graveyard 3D Shimmer in front of the coffin box and the Ghost 3D Shimmer hanging off the side of the box. I also added some of the Halloween Diecut Pack as well as a few Scary Sculpted Stickers here and there. Here I used the Raven Pattern Paper in the shadow box. I also cut the moon out of the All Hallows Moon pattern paper and added that to the right top corner . I popped up a diecut of a moon as a layer to the same corner. I also used a sticker bat and a diecut bat along with a diecut title. 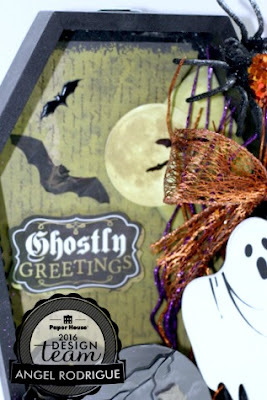 There you have it a nice Halloween piece to add to your Halloween Home Decor!